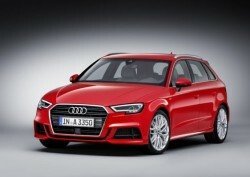 Audi has introduced the new Audi A3 which includes the alternative-fuelled variant — the A3 Sportback g-tron. The five-door compact model can use climate-neutrally produced Audi e-gas as fuel, in addition to fossil-based natural gas and renewable biomethane. The 2017 A3 has had a technological makeover starting with new driver assistance systems, newly designed headlights and taillights and an innovative Audi virtual cockpit. Equipped with a 1.4 TFSI engine producing 81 kW (110 hp), the A3 Sportback g-tron is fuel-efficient, costing roughly EUR 4 (USD 4.55) per 100 kilometers (62.1 mi). Thanks to the four-cylinder engine’s configuration for bivalent fuels, its range is over 400 km (248.5 mi) in the NEDC with natural gas fuel. When powered by gasoline, the driving range is extended by as much as an additional 900 km (559.2 mi). With numerous driver assistance systems, the new Audi A3 makes for safe driving with traffic jam assist, a further developed Audi active lane assist and Audi pre sense front, including predictive pedestrian protection. This vehicle is not yet on sale and does not yet have type approval. Until then, the vehicle is not subject to Directive 1999/94/EC, the purpose of which is to ensure that information relating to the fuel economy and CO2 emissions of new passenger cars offered for sale or lease in the Community is made available to consumers in order to enable consumers to make an informed choice.